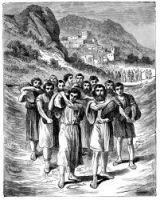 The Israelites had to pass over the River Jordan to go into Canaan. But the river was wide, and there was no bridge, nor any ships to carry them over. God told Joshua to command the priests to take up the Ark of the Covenant and to go before the people. When the priests came to the River Jordan, and their feet were dipped into the water, the waters divided, and stood up like a wall. The priests with the ark went through first, and the people followed on dry ground. 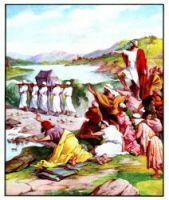 When they had all passed over, Joshua called twelve men, one from each tribe, and told them to each take a stone from the Jordan river, from the place where the priests' feet had stood upon dry ground. These twelve stones Joshua set up in Gilgal so that in the future the children of Israel would know the story of God's bringing his people through the River Jordan on dry ground. This series of images of the River Jordan are from my collection of antique Bible books. Feel free to use these pictures of the River Jordan in your creative projects. Click on the River Jordan illustrations below to see more details about saving a free River Jordan image or about purchasing the images of the River Jordan at a higher resolution.